Delivered new to Ecurie Evergreen in February of 1970, this is the only one, of the ten M8Cs built, fitted with the Ford Cosworth DFV engine. After it was campaigned at several races, with a victory in the 1970 Swedish Grand Prix as the highlight, it was sold to Nasif Formisano early in 1971. Equipped with a Ford small-block V8, it was campaigned by a succession of owners in local Argentinean races, racking up two more victories. 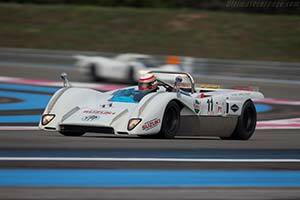 After chassis 70-01 was retired from contemporary racing, it was placed into storage by a subsequent owner in 1975. Still in crates, it was acquired by a Florida based broker. He was also able to source the original engine but it was not restored until the car was acquired by fellow American Jim Simpson in 1993. Following a complete restoration by Sasco Motorsport, it was raced by Simpson in historic events from 1996 through to 2012. In 2013, it was acquired by a Belgian historic racer, who campaigned it in two rounds of the 2015 Classic Endurance Racing series.